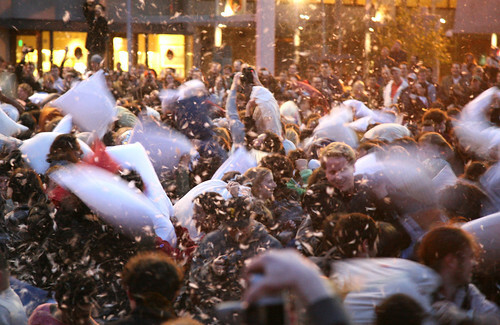 Pillow Fight returns to San Francisco for the third year in a row. The battle will commence in Justin Herman Plaza at precisely 6pm on Valentine’s Day, February 14th. Here are photos & video from last year’s massive Pillow Fight. Pillow Fight (formerly known as Valentine’s) Day is here again!!! Where: Justin Herman Plaza (Market & Embarcadero), San Francisco, CA. When: February 14th, when the Ferry Building clock strikes 6pm. 1) Tell everyone you know about Pillow Fight! 2) Tell EVERYONE YOU KNOW about Pillow Fight!!! 3) Nothing in your pillow but pillow. 4) Don’t hit anyone with out a pillow. 5) Don’t hit anyone operating a camera. The Food Bank and Coalition on Homelessness will be collecting donations this year. Help the less fortunate with pillows, blankets, clothing and non-perishable food items and don’t forget a few trash bags to help clean up. UPDATE: Here are photos and video from Pillow Fight San Francisco 2008.